The multiculturalism and peaceful coexistence between ethnic and religious communities that is traditional to Sindh is being tested as never before. However moves at the national and local level are being counted on to defuse a tense situation. The Islamic Republic of Pakistan saw yet another moment of national shame right on the day of Eid-ul-Azha when four Hindus, including three doctors, were brutally killed in broad daylight. Conflicting media messages and false claims about the motive are but an ugly attempt to justify the crime. According to the story given out to the media, the murders took place after a boy from the Hindu community sexually assaulted a girl from the Muslim Bhayo tribe. Bhayo is the third most influential tribes of Shikarpur after the Jatois and Mahars in Chak town of Shikarpur. Hindus make around 6,000 out of the total 40,000 people in Chak town and are the predominant contributors to Sindh’s economy through trade and other professions. In the local politics of the area, the Hindu community has never been as muted as it is now, after the advent of Sipah-e-Sahaba Pakistan (SSP), working openly through their unmarked offices and representatives since at least a decade. One was appalled listening to the people of the town about the immunity with which the SSP operates in Shikarpur in cahoots with the Jamiat Ulema-e-Pakistan-Fazl (JUI-F) and with the support of local tribal chiefs and state machinery, especially the police. The accused Bhayo tribe has its members in not only the ruling Pakistan People’s Party (the main accused Babul Khan Bhayo is district head of the PPP), but also in pro-Taliban JUI-F and proscribed militant extremist organisation, the SSP. According to the details gathered from the local communities, a young girl from Bhayo community went to see her Hindu friend on Diwali night. The girl was seen entering the autaq (sitting area used by males), which was unusual in the local culture. Discovering the boy and the girl together, community elders (Hindus) reportedly beat the boy and sent the girl back to her home. The event triggered the ‘honour’ of the Bhayo tribe. What made things worse was the boy’s religion. The Bhayos felt doubly humiliated. The Bhayo members of the SSP and the JUI-F started threatening the entire Hindu community since that day. The community requested the police for security after which the police established a small picket near the Hindu neighbourhood. But two hours before the incident, policemen vanished from the scene only to come back half an hour after the ambush. Just when the police pretended to start searching for the culprits, SSP and JUI-F workers gathered around the police station and amid the slogans of Allah-o-Akbar (God is Great) and Jihad Fi Sabilillah (war in the cause of God), they intimidated the police staff and asked to close the case. Resultantly, the FIR could only be registered around 36 hours after the crime. The victims’ family does not agree with the facts described in the state-registered complaint. Noteworthy is the fact that the victims were not even remotely related to the Hindu boy accused by the Bhayo tribes of being ‘karo’ (accused boy). According to a much-criticised tradition, when an unmarried couple is caught together, they are murdered after the Panchayat is informed. The accused girl (kari) is usually murdered before or with the accused boy (karo). According to the tribal code, karo can only be the one directly involved in the ‘illicit’ relations with the kari. In this case, even the principles of this tradition (unapproved by educated Sindhis), karo-kari (honour killing), were not followed. It is a case of simple and direct targeting of the Hindu community, which remains an endangered one after the religious extremists were installed in the area for running the madrassas. Madrassa tradition in Shikarpur is almost 40 years old, which is the age of the oldest madrassa here. According to the locals, Pashto speaking Niazis from Khyber Pakhtunkhwa and Punjabis from south Punjab were brought in over a decade ago. Totally alien to the local culture and traditions, they tried to impose strict Islamic code, which initially did not work. But after more than a decade, an entire generation has been out of these madrassas in the social life of Shikarpur. When I spoke to over a dozen people from the local Muslim community, I found them extremely opposed to and fearful of the Islamisation being brought to Sindh, which they saw as a part of the larger design of ruining the Sindhi culture. The fact that the common people still value local pluralistic culture is evident from the fact that over the last few days, people — mainly Muslims — are coming out in the streets every day in almost 500-600 villages and towns of rural Sindh against this incident. It was heartening to know that not only thousands (6,000 according to a conservative estimate by a member of the local Press Club) of Muslims participated in the funeral of their four fellow citizens; hundreds of them have taken upon themselves to ensure the security of the frightened Hindu community. They stay day and night at the entrance of the Hindu neighbourhood. These common people, one Hindu resident of the area said, are not only from the influential Mahar and Jatoi communities but also some Bhayos are seen among them. When asked how the SSP and JUI-F guys got such an influence in an otherwise sufi and secular culture of this city, the people proudly said that the fact that these extremists need political backing, support of the tribal influentials and police machinery, is enough evidence of their weakness. Had they had a popular support, they would not have needed any of these tactics. A local rights’ activist (Muslim), who is a key organiser of a protest rally today (Monday) at 12 noon in Hyderabad, wanted me to tell the world that Pakistanis would fight extremism till the last drop of their blood. This is Pakistan! Those in the charge of things must realise that the people of Pakistan are committed to their pluralistic values ingrained in their Sufi culture. Any effort to dismantle plural and secular social base would be met with fierce resistance. The ones who believe that we, the ‘liberal fascists’, are few in number and are irrelevant, should see how this battle is being fought by a common citizen in Sindh, original home to a wonderful Hindu community who made Shikarpur mercantile hub of Sindh before the Talpurs came in. Shikarpur was to the old Sindh what Karachi is today to Pakistan. 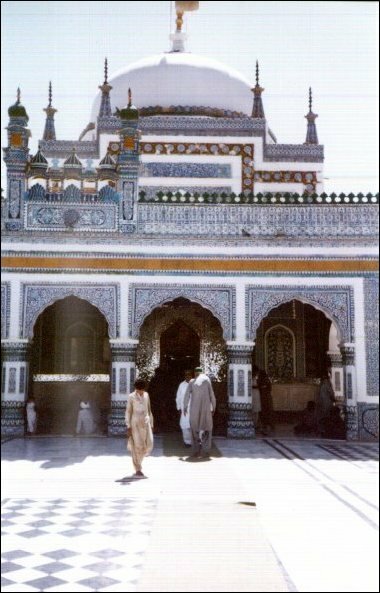 Having trade links with Central Asia, from Qandahar to Uzbekistan to Moscow, Shikarpur was the gateway of Sindh to the world. And in Shikarpur, it was our Hindu trader community that started the system of payments through cheques. Home to poets like Sheikh Ayaz, this city has produced seers and littérateurs alongside professionals of the highest quality. Today Shikarpur is determined to fight extremism more than ever. It is encouraging to know that Sherry Rehman moved an Adjournment Motion in the National Assembly on this issue that called for immediate action on the case and reactivation of the Commission on Minorities. However, there is something simpler that can be immediately done. Babul Khan Bhayo, the main accused and PPP district president, should be immediately suspended from the party and arrested. An independent inquiry should be commissioned along with completely removing the presence of proscribed organisations working in the area under whatever name. This is the bare minimum that even the most ardent supporters of the PPP would expect from the party and especially from Sherry Rehman to pursue it.